Degenerative disc disease is a common cause of back pain, which can range from mild to debilitating. 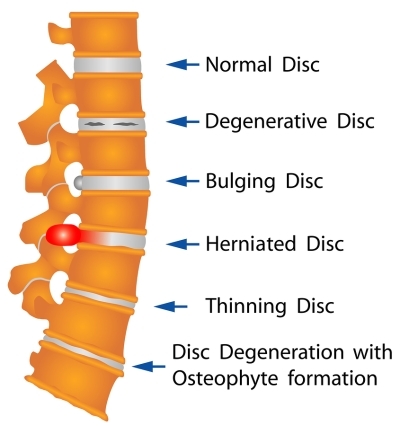 If a doctor at a spine center in Miami diagnoses you with degenerative disc disease, it means that your intervertebral discs have sustained damage. This is usually caused by age-related changes of the spine, such as the loss of water content of the discs, which can make them less flexible. Once the discs sustain damage, they cannot easily repair themselves. Fortunately, there are effective treatment options available. Your doctor may recommend medications or perhaps back surgery. If the symptoms of degenerative disc disease become bothersome, you might try over-the-counter medications for mild pain or prescription medications for severe pain. Nonsteroidal anti-inflammatory drugs (NSAIDs) can be helpful in suppressing the inflammation and providing pain relief. They include naproxen and ibuprofen, and are available both over-the-counter and formulated for prescription-grade strength. If you suffer from debilitating pain, your orthopedic doctor might prescribe stronger pain relievers for you. Be sure to find out about the potential side effects before taking any new medications. Disclosing your current medications can help you prevent adverse interactions. Cold and heat therapy is an effective way to relieve symptoms without the use of drugs. Cold therapy reduces inflammation by constricting the blood vessels in the treated area, which inhibits blood circulation. Heat therapy works by easing the muscles. Because heat therapy expands the blood vessels and supports blood flow, it may be particularly helpful for patients with degenerative disc disease. This is because the blood carries critical nutrients and oxygen to the discs, which can help them heal. Physical therapy can help you manage your symptoms both on a short-term and long-term basis. For instance, one component of your physical therapy treatment plan may involve strengthening your core muscles. On a long-term basis, this can alleviate your symptoms by giving your back more support. Less commonly, some patients with degenerative disc disease may benefit from surgical intervention. 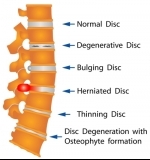 If the affected disc has herniated, the surgeon can remove the herniated portion of the disc. Sometimes, the entire disc may be removed and replaced with an artificial disc.